Have you found an online vendor selling Atlantico Platino? In the nose there are hints of spices and fruits. On the palate you can recognize chocolate on the first sip. Lately there is toffee and vanilla - way too much vanilla. This is not really a sipper, but sure can be good for some mixing. Rating would better if there was not so much annoying vanilla. bin kein kenner was weissen rum angeht.. aber er ist der beste den ich bisher probiert habe. warum? er ist fruchtig zitruss.. und nicht spritig!! 20ml uit een advent kalender. Tsja, normaal heb ik witte agricole of witte Jamaicaanse rum en dit staat daar in schril contrast mee. Niet veel smaak en of aroma. I had a few drinks of Atlantico Platino while vacationing in Oaxaca Mexico. Pretty decent bottle and label design. Very strong alcohol to the nose and palate if neat sipped. Mixes rather well with your favorite soda drinks. Sampled the Blanco expression from Atlantico at the Cardiff Rum Festival having already been familiarised with the brand having received the Reserva as part of the Craft Rum Discovery subscriptuon service back last year. Glasklar mit Silber Reflexen im Glas. In der Nase, frisch geerntete Zitrusfrüchte mit frisch geschlagenem Eichenholz, eine schöne Kombination. Im Gaumen fällt Einem sofort die Süsse auf, kandierte Früchte und Zuckerrohr. Ein super Mix-Rum der auch pur noch erträglich ist. Crystal clear with silver reflections in the glass. In the nose, freshly harvested citrus fruits with freshly cut oak, a nice combination. On the palate, immediately recognize to the sweetness, candied fruits and sugar cane. A great mix rum that is also possible to sip. Nose: not much; some sugar cane and vanilla maybe. As others stated before, this one might be a good mixer. Drinking it neat is pretty unspectacular. Lucka 18 i romkalendern 2017, betyget sammanfattar allt. Ikke specielt god sipper rom. Tænker den er fin til drinks. Inte så mycket doft och smak. (Kan bero på min snuva?). Mild och lättdrucken dock. Kort eftersmak. Tasted this as a sipping rum, but it's not me, hence the low rating. I think it would fit in a cocktail much better than for sipping. Duften fangede mig ikke, men jeg blev positivt overrasket over smagen på denne hvide rom. En frisk smag af citrus og vanille. Jeg kunne forestille mig, at den er god som en blandingsrom. The rum is from the Dominican Republic. Distilled from both molasses & sugar can juice. Shipped to the US for finishing. Crisp but still pretty smooth with hints of citrus and vanilla. Smooth white rum that has some nice flavor that works well together. Crisp, expressive, on the sweeter side, this rum is aged from 1-2 years, so not a lot has happened in terms of complexity, or enhanced flavors, but worth paying 25$ or so. The burn may hold some drinkers back from drinking this neat, but adding an ice cube or letting it breath in your glass does alter its composition. This goes for all rums and whiskeys for that matter. First I tasted this rum in drink called Platónico (Atlantico platino, tonic, ice, sprig of thyme) and I liked it a lot. Then I tasted it straight and it surprised me with its sweetness and smoothness. Nice rum yet it seems a little overpriced to me. if you´re searching for a white rum with sweetness, take the ride! 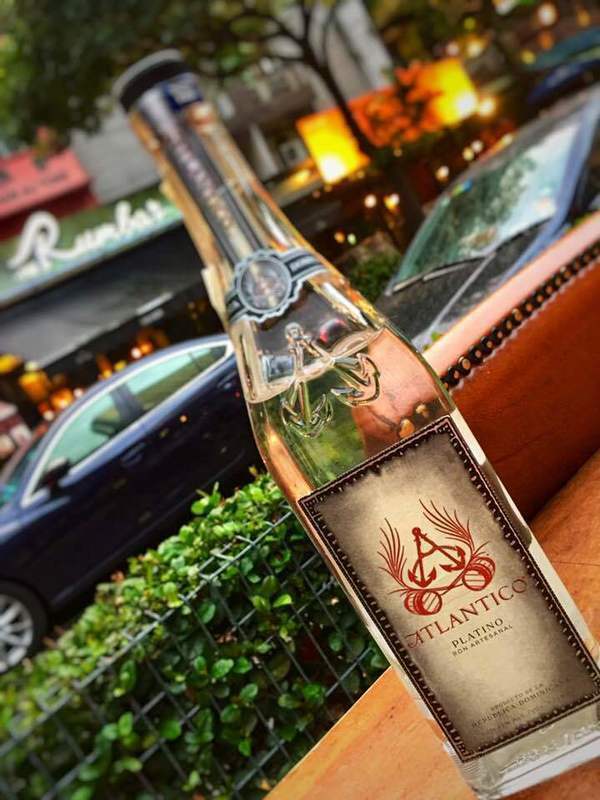 the atlantico platino is best at doing mixtures with a mild and sweet rum. you can drink it pure without ice and hand warmed. nice try! One of the only clear rums I've found, that actually has a flavor. We first picked a bottle of this up in Aruba, for my wife, because she drinks rum and cokes. Of course having drank, and enjoyed the Atlantico Private Cask, I sipped a bit of this neat. I was very surprised at how smooth it was, for a clear rum. I've started using this when I make Mojitos, it's a very good mixing rum. It is a little more expensive than Bacardi, so if your looking for a cheap mixer then this isn't for you. I was traveling and by the time I arrived my only option for a much needed night-cap was a Friday's across from my hotel. I asked the bartender if they had any higher end rums. He showed me the Atlantico Plantino. Admitting he didn't know much about rum, he told me he heard it was "the Patron of rums." Let's start with this; it most certainly is NOT the Patron of rums. OK, it's not awful. It's maybe slightly better than the standard Bacardi I was about to go with. I'm not a Bacardi basher. I think Bacardi 8 is one of the best values and under rated rums available. But the standard "Superior" is what you drink in high school and college - not once you come to appreciate great rum and can afford it. I give the Atlantico one point above Bacardi Superior because it is reasonably smooth - again compared to Bacardi, not any great rum. But I'm not sure it is rum. I can't say it's flavorless but I'll be damned if I can identify any specific flavors. Reading others' reviews that describe the chemical additives and calling it perfume hit home with me. It has a floral scent although not taste. While it doesn't taste bad, it really doesn't taste like rum, or anything else I can identify. There's no chance I'd ever buy a bottle of this stuff but stuck at a Friday's with few options, I'd probably order again. No chance I'd have more than 2 out of fear that whatever chemicals are in this stuff COULD give me a nasty hang over in the morning. A gave it a 5, and that's generous, but Bacardi gets a 4 in my book and I'll stick with this is one notch better. I had a great Mojitos at Victor's Cafe in NYC made with Atlantico. Prefer it to Bacardi Silver. Another company trying to associate themselves with the rich Dominican rum legacy that has produced so many quality rums. Atlantico is not one of them. Weak profile and not much flavor. I finally picked up a bottle of this today as only one small store in the city carries it around here. There were only a few left, after being on the shelve for quite a long time, and I doubt it will be reordered so I grabbed one. One thing to note here is that Platino is aged part from cane juice the other part is molasses. It is aged in 2 different barrels then mixed. The platino does not include any solera aging like the 2 older dark rums. Platino is simply barrel aged 1-2 years. The final note I have here to consider is that Platino ferments Aguardiente with either the cane juice, molasses or both. This is different than the 2 older dark rums these 2 rums are fermented, aged, barreled twice then put into solera system; and then after aging for some reason mixed with unaged Aguardiente before bottling. This in some way clearly adds flavor to this rum based on what the Aguardiente is made with which could be from what I have researched nearly anything. So upfront this rum is adding flavoring and otherwise modifying its profile using Aguardiente. I tested this spirit neat as I always do. It is also recommended neat by the producer. The nosing was rather light to my surprise. No harshness and I moved across the glass from the top to the bottom I had several different scents from a very slight dried fruit to a moderate vanilla it was hard to detect anything to be honest due to the lightness of the overall scent. The taste does not offer much more to be honest. The main note I get is Vanilla. It starts out rather tasteless then moves to a moderate vanilla middle to a slight alcohol taste going down. There is no burn to this rum it goes down and leaves the palate shortly from entering. This is a rum I would probably not purchase again at its price point which is fairly stable at around 19.99 a bottle. I much prefer the bacardi 1909 limited heritage edition at a lower price for a white rum and a much more flavorful unedited kick which actually tastes like rum. Nothing but perfume from this bottle. The artificial flavor this rum gives made me flat out ask the company representative of they add artificial flavors and Splenda to this rum. He was insulted I told him make rum not perfume.